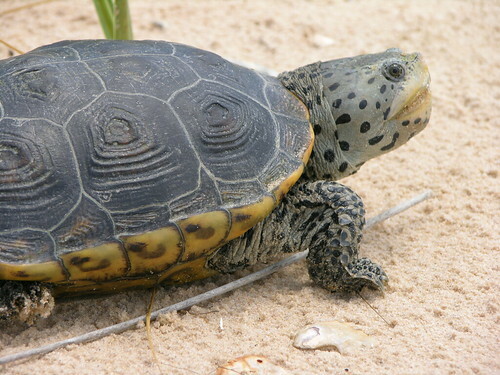 Now we’ve heard about ducks crossing the road and holding up traffic, but think of the surprise when 150 diamondback terrapin turtles were spotted trundling across a runway at the John F. Kennedy International Airport! Flights had to be delayed on Wednesday as the reptiles tried to get over to lay their eggs on the sandy Jamaica Bay Wildlife Refuge shores. Ron Marsico, a spokesman for the Port Authority of New York and New Jersey, said pilots from Jet Blue and other airlines halted their flights to let the expectant reptiles pass. “Flight delays attributed to turtles were minor, about 15 minutes or so,” he said. Port Authority staff rushed out to the tarmac to scoop up the turtles to help them along in between take-offs and landings.